07h30: Departure from Hammamet or Sousse or Port El Kantaoui for the country side. 07h45: Driving up into the Mountain of Sidi Maammar, panoramic View of the Gulf of Hammamet. 08h05: Departure for Nabeul and visit traditional Mats Shops and traditional Pottery. 09h30: Departure for El Haouaria via Menzel Bouzelfa. Drive off road across the forest of Dar Chichou. 13h00: Departure to the Cap Bon Summit. 13h15: Arrival to the mountain of Sidi Bel Bayed 340 m high view of the Summit of the Cap Bon, Zembra and Zembretta. 13h35: Departure for Korbous; Spa City. 15h00: Arrival and visit the hot spring of Ain Atrous: 30 min view of the Gulf of Tunis. 15h45: Return to Hammamet or Sousse or Port El Kantaoui via Menzel Bouzelfa Beni Khalled and Grombalia. 17h00: Arrival at the first hotel. Like a finger point out the direction of Italy, the peninsular is one of the richest parts of Tunisia. Farming and fishing are the traditional activities until the start of tourism in Hammamet in the mid sixties’. Hammamet: Due to its beaches it is a popular destination for swimming and water sports. It was the first tourist destination in Tunisia. It is located in the south east of the northern peninsular of Cap Con in the Governorate of Nabeul, on the northern edge of the Gulf of Hammamet. Nabeul:The quiet town of Nabeul lies 18km north of Hammamet and is considered the capital administrative city of Cap Bon, the Nabeul Governorate. The history of the place goes back to the Roman times, when it was called 'Neapolis'. Widely known as the capital of pottery and ceramics manufacturing, Nabeul is also a centre for the production of garum, a seasoning for all sorts of food. Make sure you get there on Fridays when the town's weekly souk (market) is held, offering wide range of wonderful Tunisian stuff on souvenir and tourist stalls. Haouaria: is on the northernmost tip of Cap Bon on the Sidi Abioud Mountain. It is a fairly sleepy coastal village of around 9,000 residents with a very remote air about it. It is also known by its Roman name of Aqualaria which means “country of eagles”. The main activity in the town is on Friday, the local market day. The white-washed buildings mostly look out on the inland fields and countryside rather than the Mediterranean. Just across the water to the east is Sicily, making this one of the narrowest points between Africa and Europe. 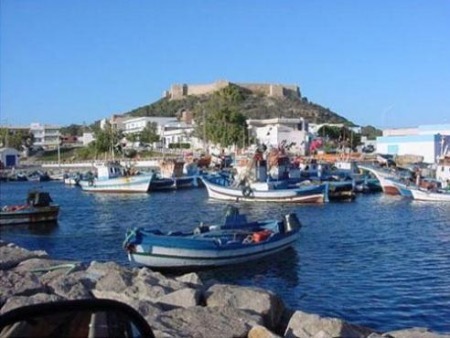 Korbous: is the first town travelers from Tunis (Tunisia’s capital) come through on Cap Bon. The settlement is famed for its thermal baths dating back to Roman times. Korbous exudes a sleepy, almost timeless quality and is well on its way to becoming a hot tip for tourists around the Cap known locally as the Fruit garden or Riviera of Tunisia. Cap Bon is part mountainous and its flat peninsula extends northwards into the Mediterranean. The Italian island of Sicily is just 140 kilometers away. Once in Korbous, the smell of mineral-infused water is quite strong – it pours through two small pools and cascades down the rocks and into the sea. The water is heated in underground grottos and comes out almost boiling. Wealthy Tunisians come to bathe in these ancient waters, known for the healing properties. The temperature was around 40 c and not a cloud in the sky, then suddenly the heavens opened, I have never seen rain like it. The proximity of the Atlas foothills means the weather is always mixed. Korbous is a most stunningly beautiful and scenic area of Tunisia and well worth a visit. The vivid bright blue of the sea and sky was almost blinding.